Cheddar (Free) by Sam Soffes should appeal to any productive Markdown geek, such as myself. Why? 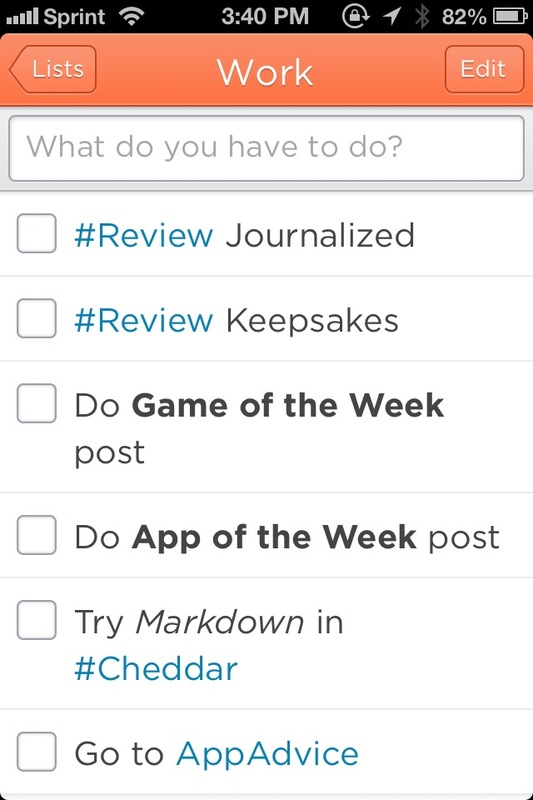 It is a lightweight to-do list app that supports John Gruber's Markdown syntax. 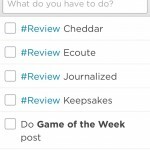 While there are certainly a lot of apps in the to-do market, I think that Cheddar is one of the better options available. First off, it’s beautifully designed. The orange that is used in the app is light and calm, not in-your-face-oƒbnoxious that I tend to associate with the color. The logo looks fantastic, and the typeface looks superb. The app is pretty simple and extremely easy to use, so you won’t have any trouble picking it up and using it right away. Secondly, Cheddar may be an iOS app, but it also has a Web counterpart. This is a huge bonus compared to other simple task managers, which may require a separate app or nothing on your desktop. To access it, simply go to the Cheddar website and login with your account, or create one if you haven't already. You'll then have access to all of your lists and tasks from the Web. Pretty handy, right? The main screen in the iOS app will be the Lists screen. To create a new list, just tap on the “+” button, give it a name, and save it. You can then start adding tasks to it. Tasks can be added by just typing it in the text field (where it asks “What do you have to do?”) at the top. 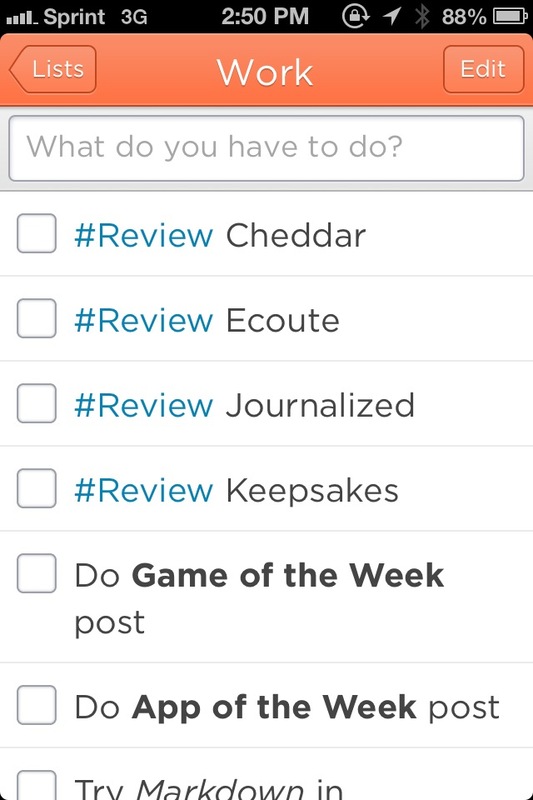 Tapping the “Go” button after you add a task will add it to the list. If you’re done with a task, just tap on it to mark it as complete, or tap on “Edit” and then the task, if you have changes to make. The Edit menu also allows you to Rename the current list, Archive (All or Completed Only) Tasks, or even rearrange the order. 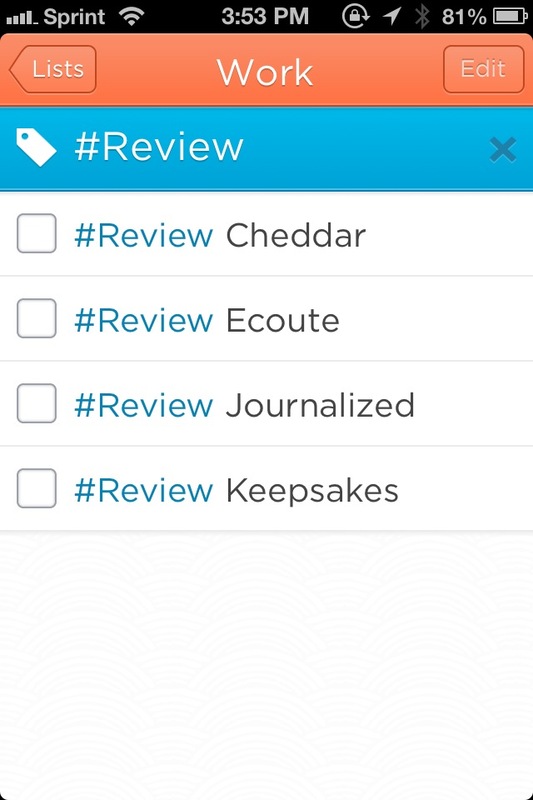 A swipe on an individual task will bring up an Archive button as well. Now, remember that I said that Cheddar utilizes Markdown? If you are familiar with Markdown, just type as you would normally, and Cheddar will format your text appropriately. Of course, since this is only a to-do app, only the necessary bits of Markdown are supported. 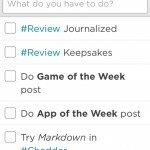 You can view the full list of Markdown features that you can use in Cheddar here. Basically: links, italics, bold, bold italics, strikethrough, code (referencing), and emoji. Additionally, you can tag any task by using a hashtag, as you would on Twitter. An example of using tags is when you are creating a shopping list — "Buy a new rug at #Ikea" will turn "Ikea" into a tag. With tags and links in tasks, they are clickable. For tags, a single-tap will allow you to filter your tasks to only show tasks with the tag, which is highlighted at the top of the screen in blue. With links, you will have to double-tap to open it in a new mobile Safari tab. Sync in Cheddar happens invisibly and instantly, so all of your lists and tasks will be updated simultaneously across their servers. So if you make one change on your iOS device, its show up right away on the Web or any other iOS device with Cheddar. 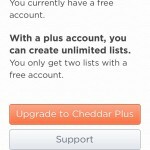 Cheddar is free to use, however, you will only get two lists. 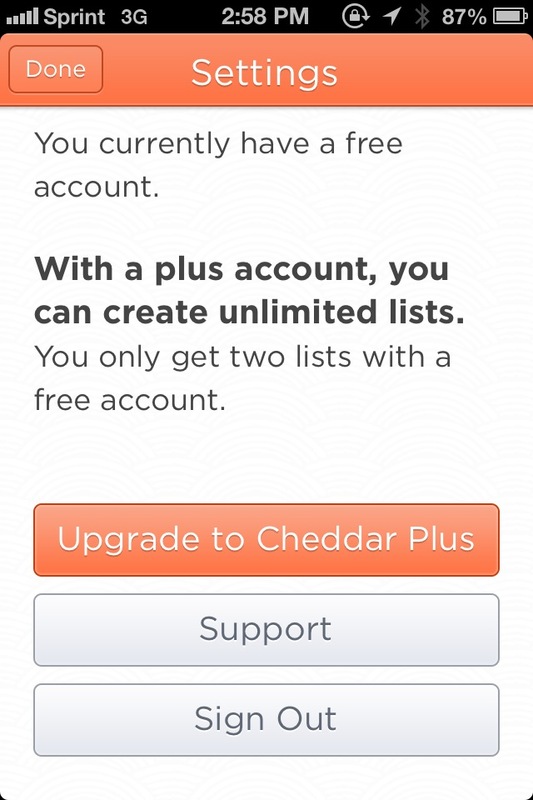 If you get a Cheddar Plus account, you will be able to make unlimited lists. 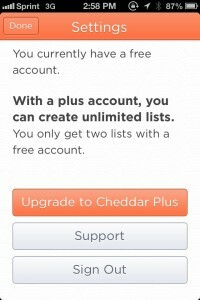 On the website, you can purchase Cheddar Plus for $1.99 a month or $19.99 a year. Through the app itself, you will be able to get three months for $5.99, six months for $9.99, or the year for $19.99. I’ve been using Cheddar for about a month now, and I am definitely impressed by the speed and simplicity of the app. Plus, it’s just downright gorgeous. However, that isn’t to say that there isn’t room for improvement. Currently, there does not seem to be a way to access archived tasks — they seem to just disappear. It would be nice to see an “Archive” list in the future to get access to tasks you may have accidentally archived. It would have also been nice to edit an item by tapping the text on it, rather than being required to hit Edit and then select the task. Though, I don’t think everyone would need to frequently edit tasks. While I understand the need for simplicity, I wish there was a daily reminder to check Cheddar (the app has no other settings besides upgrading to Plus). However, Cheddar doesn’t want to nag you, which is completely understandable. The developer wants users of the app to feel motivated to check Cheddar everyday to see what they have to do — after all, these are your tasks, right? 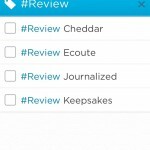 Despite these small nitpicks, Cheddar is still an excellent simple list app with useful features. It’s completely free to use (just with the restriction of two lists) with an amazing syncing solution, so it doesn’t hurt to try it out for yourself. 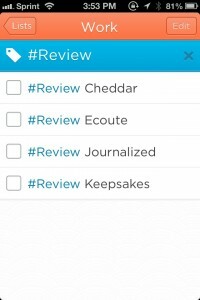 I’ll definitely be keeping this app on my iPhone for simple lists. Don’t miss out on a slice of this Cheddar!